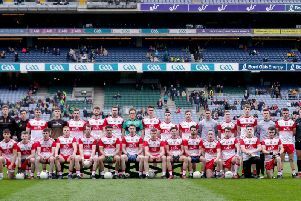 Having seen off the challenge of Roscommon in their opening game at home, Tyrone face a trip to Croke Park this Saturday night to take on title favourites Dublin. Jim Gavin’s side have not only won back-to-back All Irelands but they are going for five division One league titles in a row and are unbeaten in their last 30 games. When you mention those stats you know the task that faces the Red Hands but Tyrone have a good record in the league against the Dubs at Headquarters and midfielder Colm Cavanagh is looking forward to the game although he knows that they are going to have to cut out the mistakes if they are going to get a result. “The lads work very hard, it’s a high intensity game these days,” said Cavanagh. “We are fit enough to do it and it is going to be very important to keep that up against Dublin. “Dublin are going to be warm favourites, there is no doubt about that as they are the reigning league and All Ireland champions. We are going to have to up our intensity level and we are going to have to cut out a lot of mistakes that we made against Roscommon. “There was a lot of unforced errors on our behalf against Roscommon, a lot of possession given away and that is something that we will have to work on this week because Dublin are one team that will punish you. Tyrone go into this weekend’s game with a doubt over Mattie Donnelly after the All-Star went off with suspected concussion in the opening quarter and Colm knows how big a miss he will be if he isn’t passed fit to play. “He would be a massive loss if he isn’t able to play,” said the Moy man. “Mattie has been one of our best players for the last number of years so to lose him would be a big blow but we have a good squad and if he isn’t there then whoever comes in will be able to do a job for us.